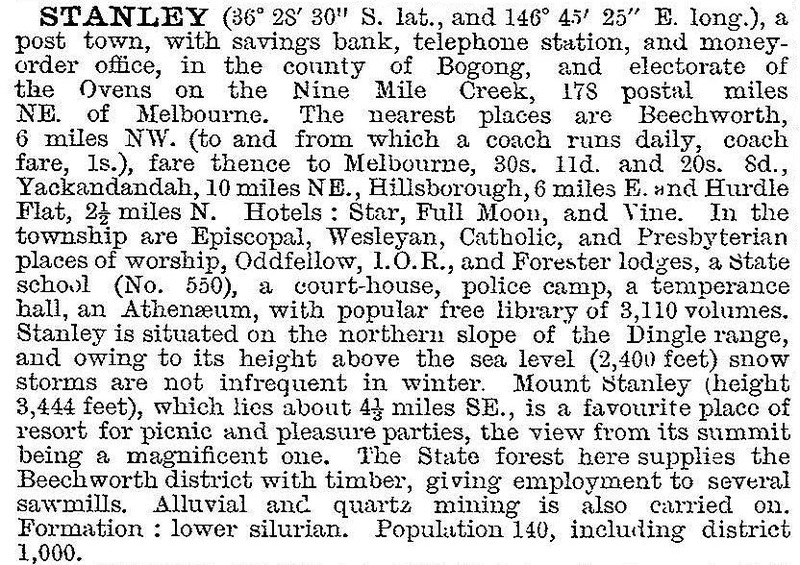 Stanley, a rural village in north-east Victoria, is 8 km south-east of Beechworth and 225 km from Melbourne. It is situated on Nine Mile Creek. In 1852 gold was discovered in the vicinity of Stanley and the locality was named the Nine Mile Diggings; the track from Beechworth to the diggings covered a distance of nine miles. In a short time the diggings comprised two localities, Upper Nine Mile and Lower Nine Mile, the former being closed for the surveyed town of Stanley in 1857. It is thought that the name was given as a compliment to Lord Stanley, British Prime Minister (1852 and several times thereafter). River-dredged gold mining consumed vast amounts of timber from the forests around Stanley and in 1931 the first of several softwood plantations was started. Bigger plantings occurred after the 1939 bushfires, east of Stanley. A softwood mill operated in Stanley during 1950-73 and a hardwood mill continued until several years later. Intensive agriculture was somewhat relinquished in the 1970s-80s, although orchards have outlasted potatoes. Berries and chestnuts are also grown. Stanley had a school (6 pupils, 2011, closed 2013), a general store, a recreation reserve, a memorial hall (1956), an athenaeum (1874) and library room and a Uniting church. The old Turnbull's apple coolstore is a short way out of Stanley. Fruit and tree nut growing accounted for 5.7% of employment at the 2011 census with hazlenuts a new crop.